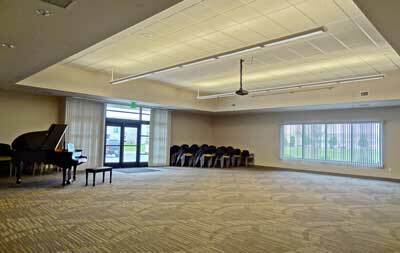 The Madison Library District’s Community Room boasts a beautiful baby grand piano, a warming kitchen, and sound and projection equipment. Reserve now for your next recital, meeting, wedding reception, or party. Please read the policy before submitting a request. By making a reservation, you are agreeing to abide by this policy. Please check the availability calendar to see if the date and time you want are available. Your reservation is not complete until you have been notified by a librarian. You will receive a phone call confirming your date and time. Please allow at least 24 hours for a librarian to contact you about your reservation, not including weekends. The room can be reserved anytime from 8 am to midnight Monday through Saturday. Before submitting a request, please check that the date and time you want are available. Click on each event on the calendar to see the start and end times of reservations that have already been made. If a date appears in gray, there are currently no reservations and the room is available anytime on that day (except Sundays). Please note both the start and end time of reservations and allow for half an hour between events. Reservations must be made in two-hour blocks. Any exceptions to these rules that appear on the calendar are library-sponsored events.